1. The Current Parkway Proposala $66 Million Walled Street? The City of Peterborough is conducting a Municipal Class Environmental Assessment (EA) to find transportation solutions to issues such as future road congestion, collisions, and the perceived need for better connections to the south end of the city. While it was designed to identify and evaluate alternatives, it has focused on whether to build a road through the currently natural Parkway corridor, both south and north of Medical Drive. The City’s consultant, AECOM, is conducting the EA process with public input at 4 previous meetings. AECOM is recommending a staged approach to construction which will ultimately see a four-lane road through most of the Parkway greenspace from the existing Parkway at Clonsilla Avenue through to Chemong and then two lanes to the Zoo. This will include a four-lane bridge that will span Jackson Park, 4 double-lane roundabouts, 1 new traffic signal, plus sound walls, berms, rerouted streams, and raised roadways. The existing trail will run alongside the new road. The four-lane option only appeared at the third public consultation meeting and is not in the 2012 Transportation Plan. The Fairbairn/3rd Line to Water/no bridge option would best solve any predicted future congestion and have less impacts. The four-lane project will cost $66+ million (land, construction), plus $236,000 per year to maintain. Land is to be acquired in 2019, the road and bridge built in 2020, and the project operational by 2021. However, once approved, construction could begin at any time, as early as spring 2014. 2. Why the Concern about the Parkway? the project will raise either property taxes or income taxes – there’s just 1 taxpayer! we have more important financial priorities in the City: jobs, housing, flood control, recreation, transit, etc. road and bridge maintenance costs will be some $236,000 a year and will add more future costs for refurbishing this extensive (and expensive) new infrastructure. 3. I Thought the Parkway was Voted Down. Where are We Now in This Process? The Parkway was proposed as a city by-pass in 1947, and then abandoned in 1970. Jack Doris beat Sylvia Sutherland to become mayor in 1991, largely due to his opposition to the Parkway. Citizens voted against the Parkway 55% to 45% in the 2003 referendum. Council then voted to remove the Parkway from the Official Plan—but this was never done. Previous consultants did not identify the Parkway as a priority. The 2012 Transportation Plan and Budget identified one part of the Parkway as a project for 2022 and beyond. However, this was changed in spring 2012 when the City hired a consultant to study the Parkway corridor. The budget for the study was increased in May 2013 to now total $1.05 million. AECOM was hired to conduct the study. Public Information Centres were held in November 2012 (introduction, problem statement), and in 2013: March (alternatives), June (Jackson Park alternatives), and September (design details). AECOM and city staff plan to bring the Parkway road and bridge recommendation to City’s Committee of the Whole on November 13, and then to a public Council meeting on November 20. Depending on Council’s decision, AECOM will then file a final EA document for 30 days of public comment. Once approved, the City will be able to build the Parkway road and bridge whenever it is ready to do so. Council will also decide on the 2013 and longer term capital budget in December (Parkway included). 4. What are the Concerns with the Process? What type of community do you want to live in? It’s your taxes! 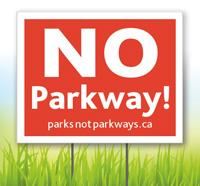 Find out more details within this website, call/write your councillor, get a sign, go to the Nov. 20 meeting, and Act Now!